People are always asking me different ways to use my favorite seasoning of all time — za’atar. 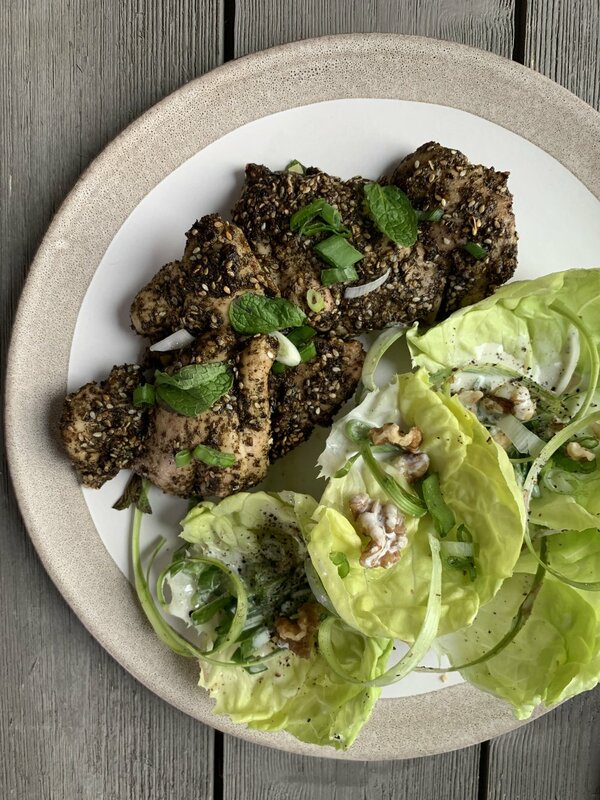 I have to say the quickest and the most efficient way of adding a ton of flavor to protein is making this za’atar marinade. Unlike other marinades that might require some time, this one just needs a good rub on your choice of protein, and it’s good to go! I added extra sesame seeds for its texture, and you can use this marinade on anything you would like from tofu to shrimp. It is a perfect, simple dinner that will be your go-to recipe. Line a sheet tray with parchment paper and spread the chicken on there. Cook for 12-15 minutes, until tender but still juicy. Garnish with scallions and fresh mint. A few years ago, I found this beautiful, mostly plant-based food blog, called The New Baguette. After many years of following her on Instagram, I finally messaged Alex, who runs The New Baguette, hoping that we could collaborate on fun recipes together. After bouncing a few ideas with each other, Alex told me about varenyky, Ukrainian stuffed dumplings. I have always been intrigued by dumplings from different cultures. Empanadas from Mexico. Mandu from Korea. Sambousek from Lebanon. 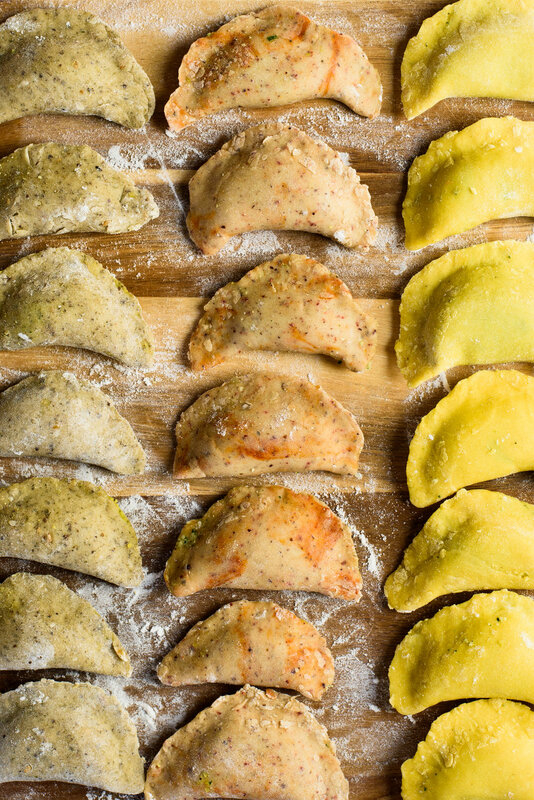 Ravioli from Italy! They are all basically savory fillings, wrapped in a dough, and living in Greenpoint, I eat my fair share of Polish pierogis. Alex is Ukrainian, and when she introduced me to her take on traditional varenyky with potato filling and fried onions, I immediately thought of ways to add my Lebanese twist — falafel! We decided to have fun with the recipes by making different falafel fillings with different doughs. Since it was our first time making this together, we weren’t sure how these would come out, but we were pleasantly surprised how delicious they were. 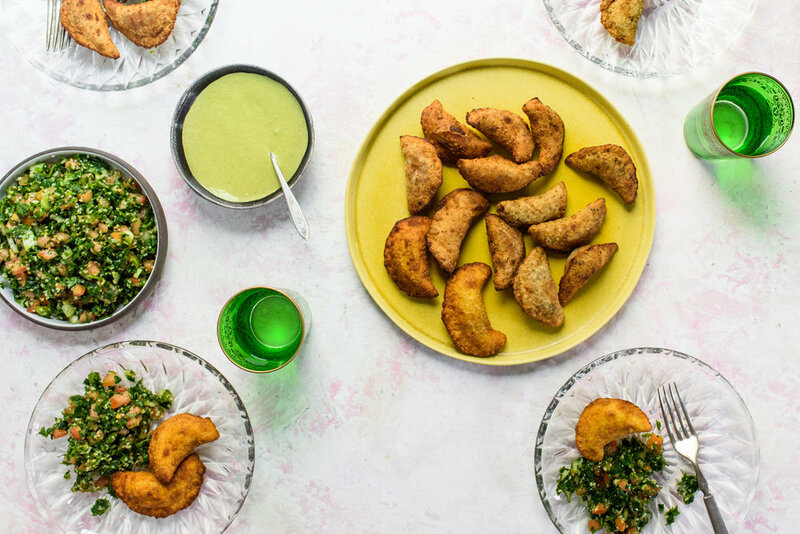 Herbaceous, fresh flavors of falafel fillings worked so well with chewy, crispy dough. For Basic Falafel Varenyky, I kept things simple but added a bit of turmeric to the dough for extra color. The falafel filling is a standard falafel recipe, so if you want to make falafels, you can simply omit the dough and fry the filling alone. Just like making dumplings, you add the filling and close the dough into a half-moon shape and pinch the ending so that they are stuck together. It’s super easy and no need to feel intimidated! Now you have the basic version, have a little fun by adding different flavors and mix & match! Alex and I made two other varieties, inspired by the original. Sumac & Aleppo Pepper Varenyky is perfect for those who are looking for some spice! Curry & Green Peas Varenyky is great if you are looking for different textures, and the curry flavors are delightful. 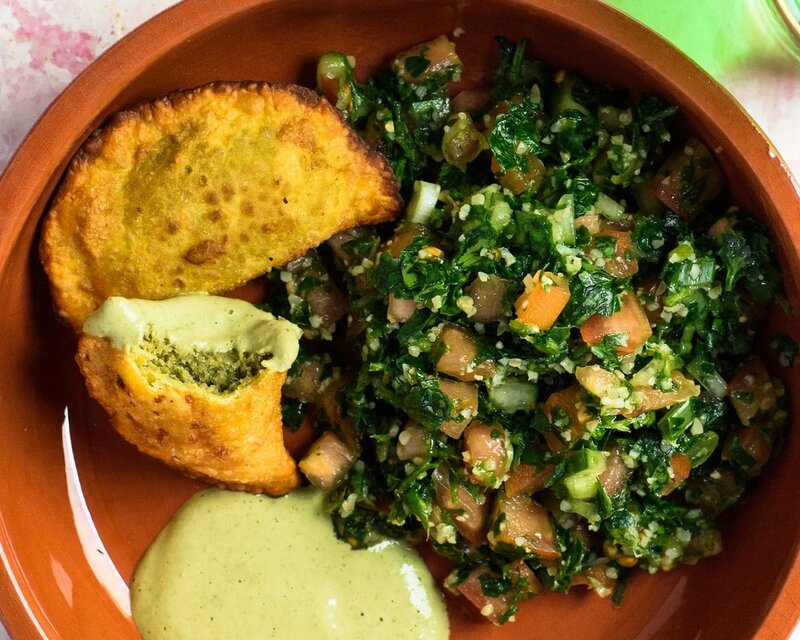 Tabbouleh is a fantastic side dish to go along with these varenyky! These varenyk are great as they are, but they are even better with flavorful dipping sauce. 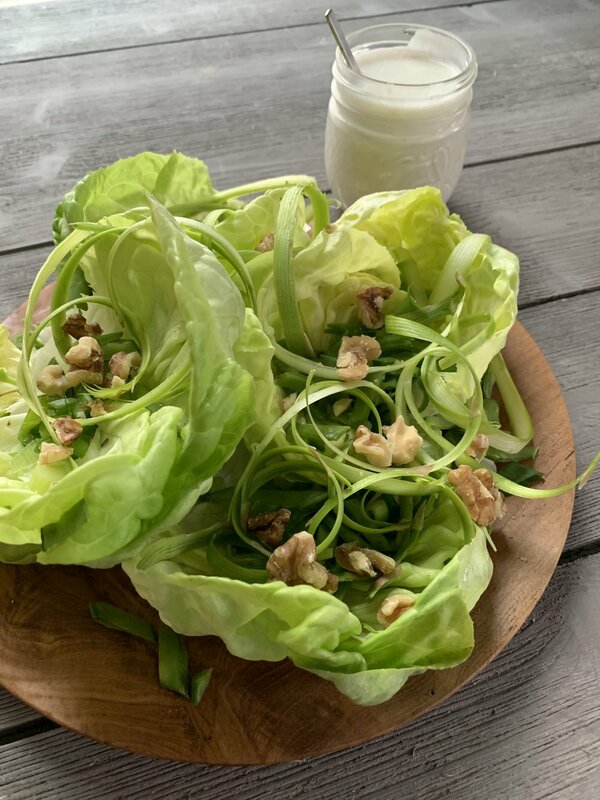 Alex has a great recipe, cilantro-lime tahini dressing, which pairs so well with these varenyk. It’s tangy, bright, and just full of flavors!